The Greenland melt images here are updated daily, with a one-day lag. 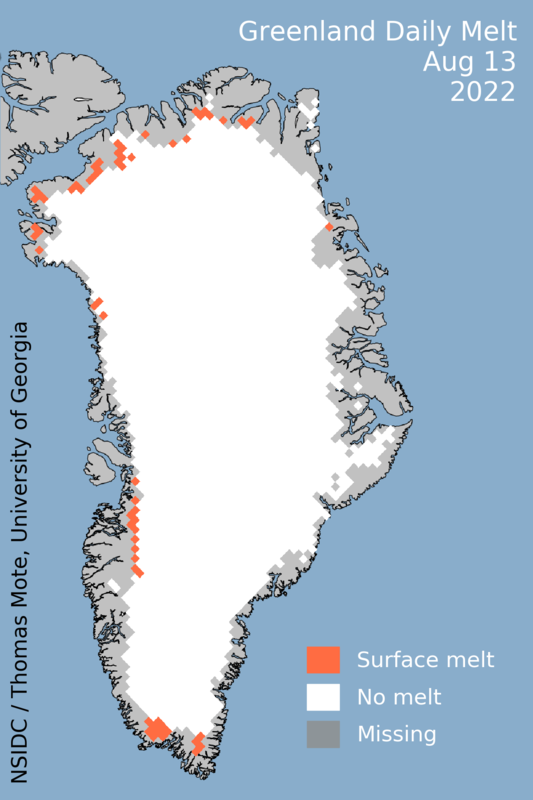 The Daily Melt image (left) shows where the surface of the Greenland Ice Sheet showed melt on that day. The Cumulative Melt Days image (right) shows the total number of days that melt occurred, year to date. Areas along the coast are masked out because the satellite sensor’s resolution is not fine enough to distinguish ice from land when a pixel overlaps the coast. Note that the northeast coast (northern Peary Land and Kronprince Christian Land) is showing erroneous melt pixels. This is a false melt signal from seasonal snow and patchy ice areas, where our method of determining surface melting does not work. This issue does not affect trends for the entire ice sheet. We are working to improve the ice sheet mask. Learn about update delays. Read about the data and other problems which occasionally occur in near-real-time data. The daily image update isn’t current; why? The daily image update is produced from near-real-time operational satellite data, with a data lag of approximately one day. However, visitors may notice that the date on the image is occasionally more than one day behind. Occasional short-term delays and data outages do occur and are usually resolved in a few days. 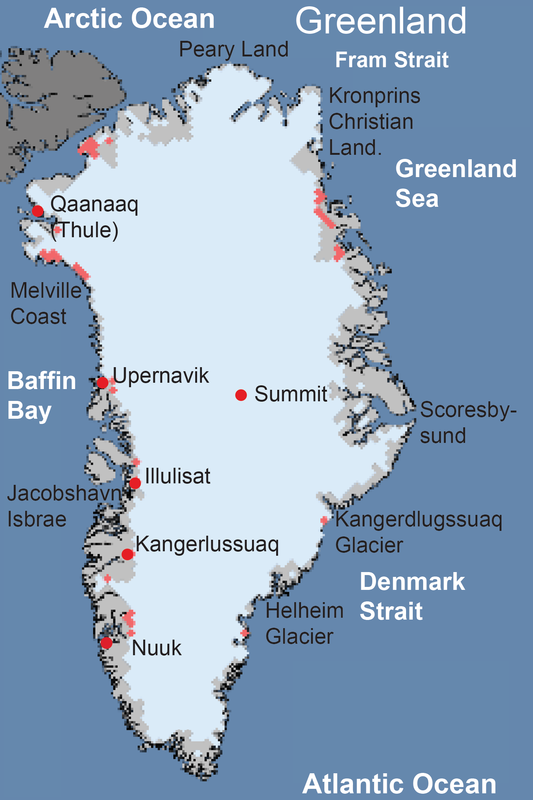 Get daily satellite images and information about melting on the Greenland ice sheet. We post analysis periodically as conditions warrant. Click an image for a high-resolution version. Daily updates have resumed for the 2019 melt season. Daily melt extent mapping is suspended for the winter. Calibration of yearly melt detection requires analysis of the springtime snow conditions by a separate program. See our March 18, 2013 post for more discussion of melt calibration. Our new interactive chart supports a retrospective look at past Greenland melt seasons. This will remain active for our users. We will resume the daily image updates in April 2019. 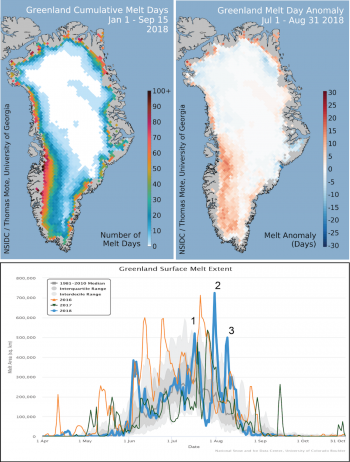 Three major melt events during late July and August brought the 2018 Greenland melt season to a close. Overall, conditions on the ice sheet were slightly warmer than average for the second half of the summer. From October 2017 to September 2018, continued heavy snowfall on the southeastern coast resulted in near-record snow mass added to the ice sheet. In July and August, the number of surface melt days was above average along the southwestern coast, reaching well up into the ice sheet. Surface melt was below average in the northwestern and northeastern areas of the ice sheet, but melting in the southeast increased after the early season. 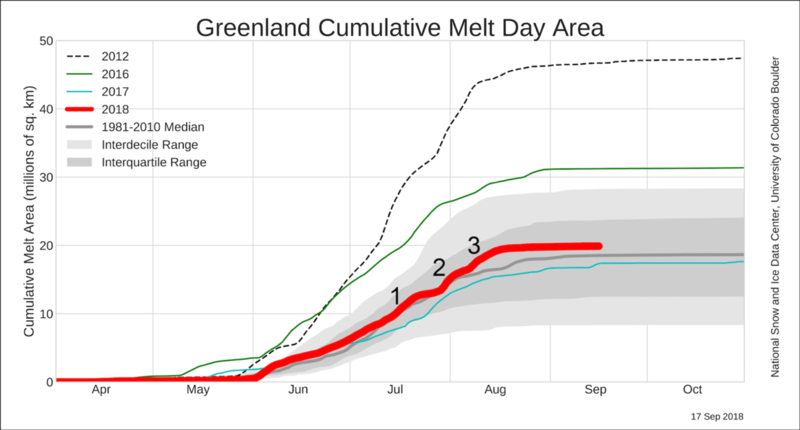 Three significant melt events peaked on July 17, July 31, and August 9. While none of these were exceptional, they were among the highest melt extents for those dates in the satellite record, at or above 500,000 square kilometers (193,000 square miles)—roughly a third of the ice sheet. High atmospheric pressure contributed to the melt events on July 31 and August 9. Strong winds from the southeast were linked to the melt events on July 17 and July 31, and from the southwest on August 9. Surface temperatures during the events were generally 2 to 5 degrees Celsius (4 to 9 degrees Fahrenheit) above the 1981 to 2010 average. Overall, higher-than-average temperatures of 0.5 to 1.2 degrees Celsius (0.9 to 2.2 degrees Fahrenheit) above the 1981 to 2010 mean characterized the second half of summer. The only exception was the northwestern area near Thule, where temperatures were as much as 0.5 degrees Celsius (0.9 degrees Fahrenheit) below average. Figure 3. 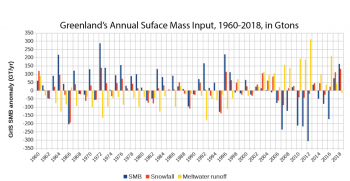 This chart shows the model results for the Greenland Ice Sheet snowfall and melt runoff since 1960. The model (MAR 3.9) was run using input from National Centers for Environmental Prediction (NCEP) weather reanalysis data. 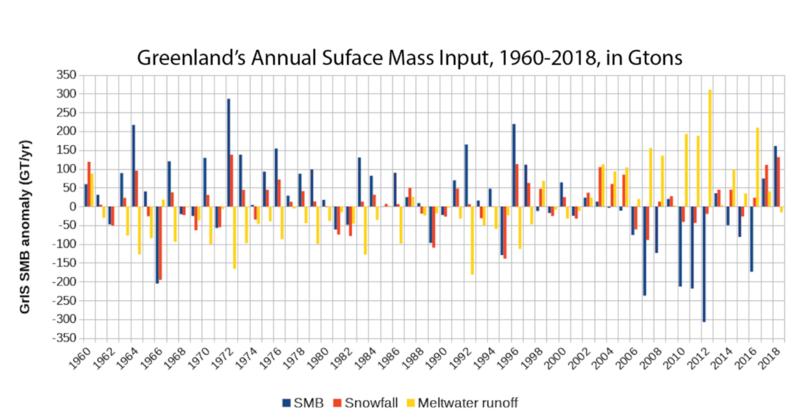 The surface mass balance (SMB) refers to the net difference between snowfall input and meltwater runoff, or evaporation, loss. The bars show the relative difference from the 1981 to 2010 reference period of observations and modeling. As noted in the previous post, exceptional winter snow accumulation and heavy, summer snowfall, drove the net snow input mass to 130 billion tons above the 1981 to 2010 average. This was followed by a near-average melt and runoff period, resulting in a large net mass gain for the ice sheet in 2018 of 150 billion tons. This is the largest net gain from snowfall since 1996, and the highest snowfall since 1972. However, several major glaciers now flow significantly faster than in these earlier years. The net change in mass of the ice sheet overall, including this higher discharge of ice directly into the ocean, is not clear at this point but may be a smaller loss or even a small gain. This is similar to our assessment for 2017, and in sharp contrast to the conditions for the preceding decade. Persistent winds from the northeast triggered high snowfall for 2017 to 2018 along the eastern Greenland coast. These winds blew across open ocean areas allowing the atmosphere to entrain moisture and deposit it as heavy snowfall on the ice sheet. Figure 4. 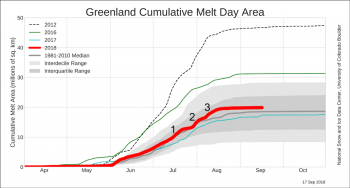 The top graph shows the 2018 reflectivity trend for the entire Greenland Ice Sheet through September 15, and four reference years: 2000, 2010, 2012, and 2017. The grey band represents the 5-to-95 percent range for the 2000 to 2009 reference period. 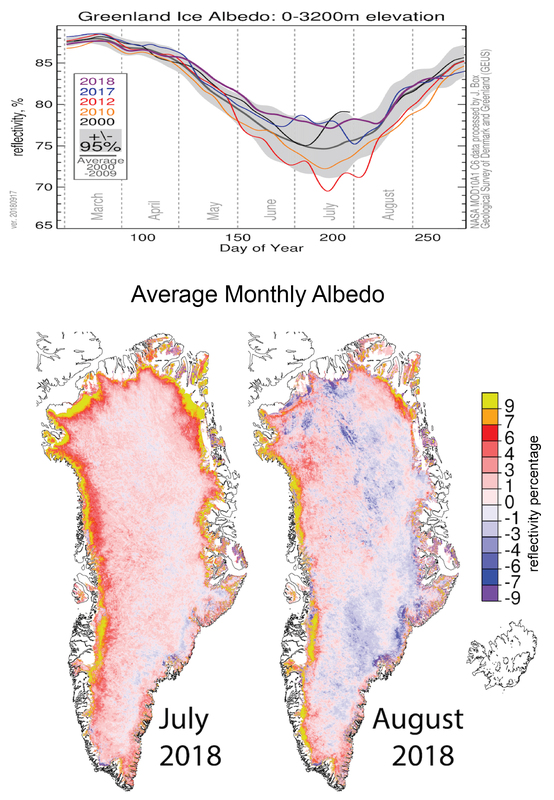 The maps below show average monthly albedo, or solar reflectivity, for July 2018, on the left, and August 2018, on the right. High winter and spring snowfall, and a moderate initial pace of melting, resulted in a more reflective (higher albedo) surface for the ice sheet than in past summers. Since bright, fresh snow blanketed areas that were once darker, such as dirty snow or bare ice, July’s average albedo for the ice sheet was 5 to 9 percent above the 2000 to 2009 reference period. Wet snow also has a darker surface, or lower albedo. Increased surface melting, above-average temperatures, and the three spikes in melting, August’s albedo decreased to more average values. However, the albedo along the western coast remained above average. The annual publication of the Arctic Report Card is expected in December, which will include more details of all aspects of the 2017 to 2018 period for Greenland’s climate and ice sheet. 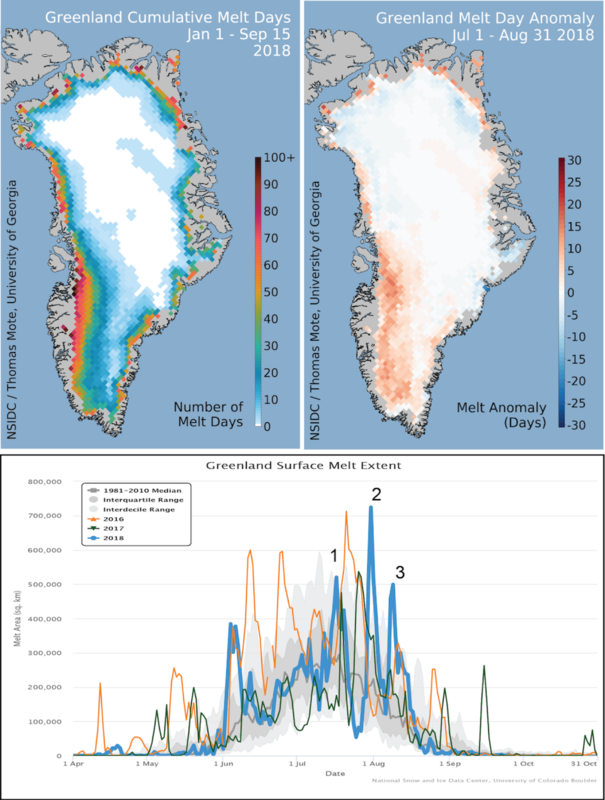 Greenland Ice Sheet Today is produced at the National Snow and Ice Data Center by Ted Scambos, Julienne Stroeve, and Lora Koenig with support from NASA. NSIDC thanks Jason Box, Xavier Fettweis, Chris Shuman, and Thomas Mote for data and collaboration. Acknowledgements: Greenland Ice Sheet Today is produced at the National Snow and Ice Data Center by Ted Scambos, Julienne Stroeve, and Lora Koenig with support from NASA. NSIDC thanks Jason Box, Xavier Fettweis, and Thomas Mote for data and collaboration.